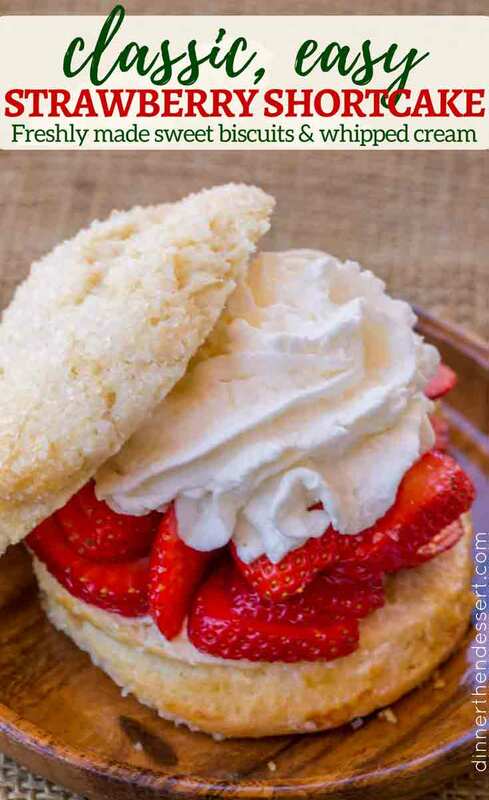 Easy Strawberry Shortcakes with freshly made sweetened biscuits, homemade whipped cream and lightly sweetened strawberries in less than an hour. 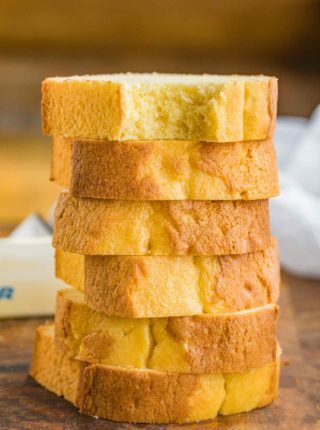 You can also make this recipe with Vanilla Poundcake or Yellow Cake and top it with Fresh Whipped Cream. 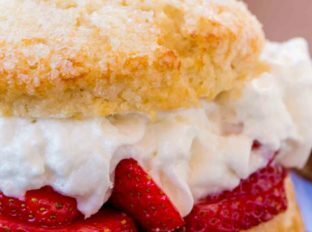 Easy Strawberry Shortcakes are the most exciting part of strawberry season to me. Yes, there’s always the strawberry pie (coming soon!) but strawberry shortcake is a dessert weakness of mine with the sweetened strawberries, fresh whipped cream and warm from the oven biscuits. The only other strawberry dessert that hold a candle to this recipe is my New York Cheesecake topped with my Easy Strawberry Topping. 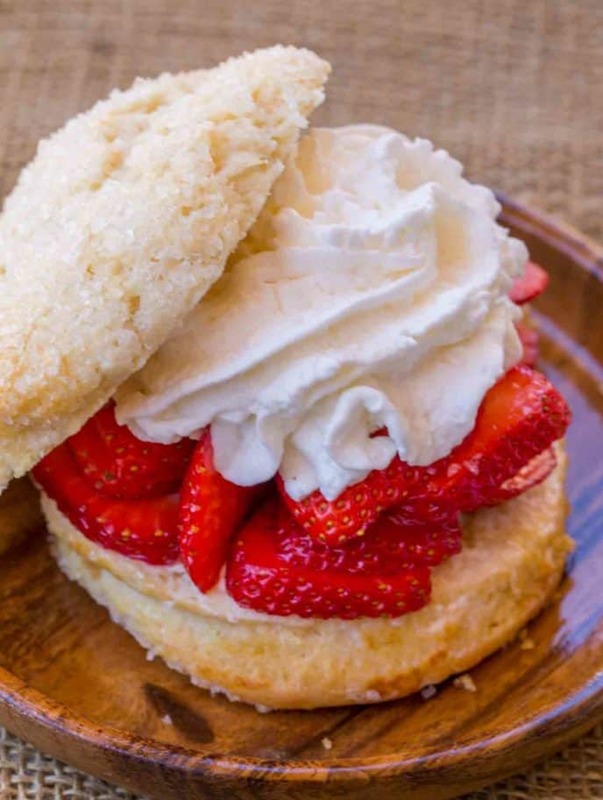 This recipe for a sweetened biscuit topped with sugar crystals is the perfect flaky, shortbread style moistened cookie flavored mate to the juicy strawberries that are punched up with just a bit of lemon juice and the fresh whipped cream that makes the shortcake really creamy. The dough is make in the food processor so it isn’t tough, with just enough sugar to make it sweet. It is combined until just crumbly so the all-purpose flour is mixed just enough to be combined and not enough for the dry ingredients to be overworked. The top is sprinkled with sugar crystals instead of granulated sugar which totally make this dish. They’re crunchy and sweet and when added to the super tender, they add the PERFECT texture. 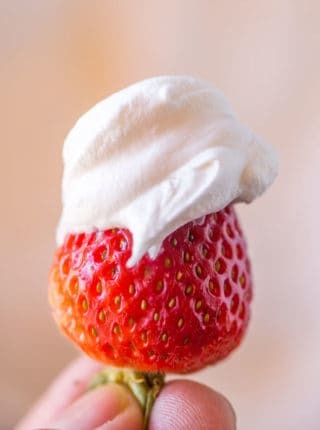 The filling is simple, a slightly sweetened pile of strawberries topped with a classic whipped cream. The magic is all in the biscuit recipe. 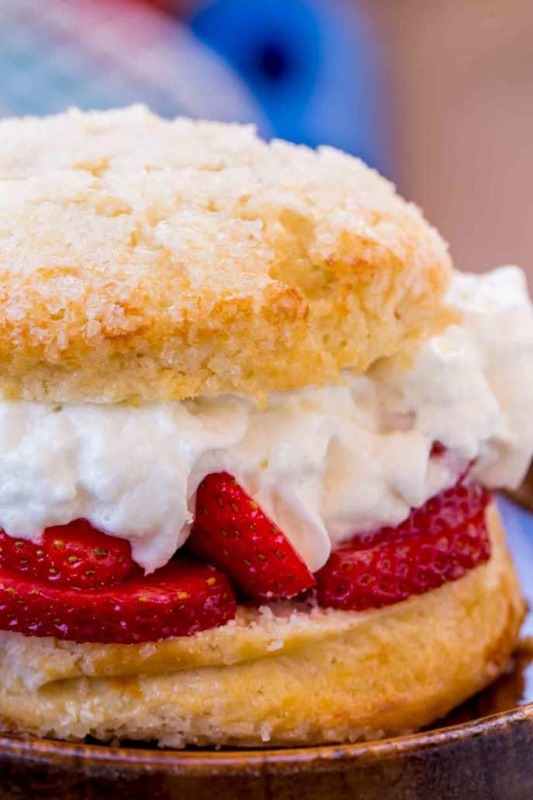 You’re going to love how easy these strawberry shortcakes are to make! The Strawberries are not macerated in this recipe, they’re simply tossed with granulated sugar and allowed to sit so they can naturally release liquids. You can macerate them if you’d like but the presentation of the dessert will suffer. The Whipped Cream is made using ice cold heavy whipping cream in a stand mixer or large bowl that is ice cold. The colder both of these are the better your whipped cream will be. Adding a bit of vanilla or almond extract to your vanilla will also add a great dimension of flavor. Note: Sometimes Whipping cream is sold as heavy cream or whipping cream in the store, you are just looking for cream that is 40% milk fat for the perfect whipped cream consistency. I “shaped” these by actually using a medium cookie scoop. 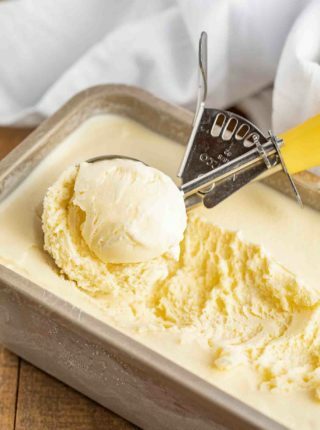 When using a spoon there will be smaller spikes and unevenness in the shape of the biscuits, while the ice cream scoop allows for a smooth texture. Simply sprinkle on the sugar crystals before baking. If you want a more perfectly shaped biscuit you can also use a biscuit cutter, but I like the old-fashioned look when I make homemade strawberry shortcake. buy local/organic berries or better yet, get them from a farmers market since they would’ve been the freshest. Avoid white/green coloring, those are unripe and picked too early. The deeper the red more flavor. Check the boxes if it looks like maybe a strawberry or two was removed from the package it is likely old. Produce employees routinely pick off moldy strawberries and leave the rest of the package (Check the weight to see if this happened if you are suspicious). How firm are they? Fresh strawberries are firm and look juicy. If they look wrinkly or slightly soft, they’re old. Use Homemade Cool Whip instead of whipped cream. Use Vanilla Ice Cream in addition to the whipped cream. If you are looking to mix up the flavors make this a berry shortcake by adding in raspberries and blueberries. If you are craving Strawberry Shortcake but your strawberries are not in season make my easy strawberry topping in place of fresh fruit. Add Easy Chocolate Fudge Topping or shaved chocolate on top. Sliced bananas, chocolate fudge topping and vanilla ice cream turns this dessert into a banana split shortcake. Looking for more strawberry desserts? Fresh Strawberry Crumb Bars and 3 Ingredient Fresh Strawberry Sorbet are also delicious! Sheet Pan: High quality, low in price and won’t warp at the higher temperatures. Silicone Baking Mat: Protects the bottoms of the biscuits from sticking or burning. Sugar Crystals: The crispy topping is made with this and it takes the dish over the top! Using a cookie scoop, add the shortcake dough onto a silicon baking mat on a sheet pan and sprinkle each dough mound with 1/2 tablespoon of sugar crystals. In a medium sized bowl add the heavy cream and beat with a hand mixer or in your stand mixer until soft peaks form. 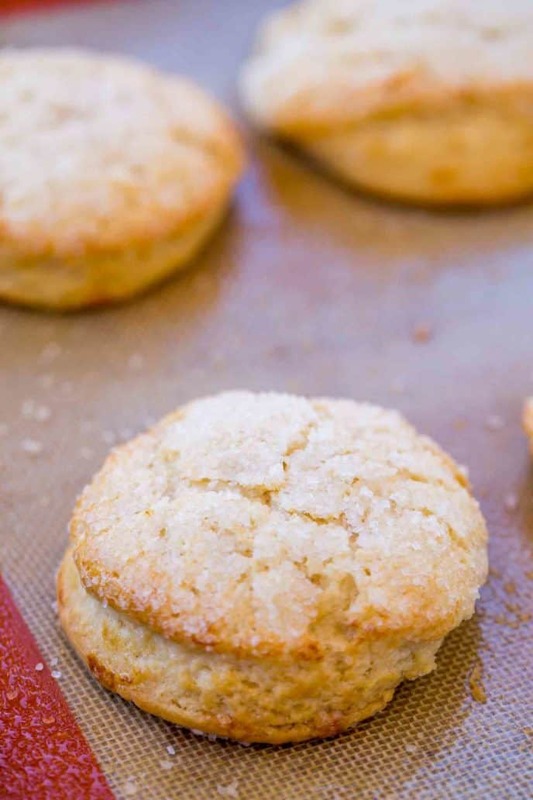 Once the biscuits are cooled, split them in half, top with strawberries and whipped cream (Using a spoon or a pastry bag with a #1 tip), then top with the biscuit top. These turned out fantastic! Thanks for another great recipe!!! You’re welcome! Thanks for the 5 stars. Such a delicious Spring & Summer dessert! YUM! Get me in the mood for sun and warmth, for sure! This looks fabulous but I’m confused about the directions for the sugar. It says to add flour, 2Tbs. sugar, baking powder salt and butter and food process. Then for whipping cream add 2Tbs. sugar but the ingredients only list a total of 2 TBS. Please clarify. I’m so excited for you to try this! The 1/4 cup of sugar is split between 2T is step 2 and the other 2T in step 6. I hope this helps! Enjoy. My family always loves strawberry short cake and this mini version with the sugar coating with have them going wild! Can’t wait to try!! 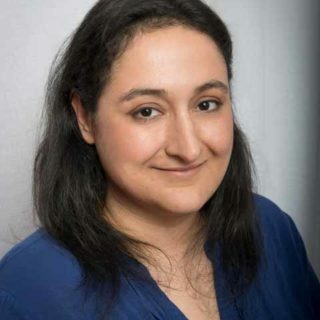 I hope you all enjoy it, Natasha! One of my all time favorites! Love strawberry shortcake! I love strawberry shortcake! This is a perfect dessert with homemade biscuits and fresh cream! So glad you enjoyed it, Lori. How long do you think these would stay fresh? My daughter wants them for her sweet 16 party but there will be a lot of people so I’m hoping to be able to make them in advance…. If you’re making these in advance, my recommendation would be make the biscuits a day or two ahead of time and keep them in an air tight sealed container. I wouldn’t assemble them until the day of. Hope this helps! Local strawberries are so sweet and juicy this year I bought eight baskets~each was between eight and 10 pounds. Hopefully today I’ll slice them and bag most of them for the freezer. California strawberries are in season now and hitting the stores….I know what’s happening in my kitchen this weekend! And hey, that crunchy sugar on top….is the BEST IDEA EVER! Thank you so much! It really does give that extra bit of yumminess! Such a wonderful dessert!! Perfect for Valentine’s Day!! What a great way to finish off our strawberries in the fridge! What do you suggest for those without a food processor or blender? Can I just “cut in” the butter like I do for biscuits, then fold in the milk afterward? Thanks! Looking forward to this decadent dessert! Yes, cutting it in with a pastry cutter would work too. Hope you enjoy it! These look like a dream. The shortcakes are so fluffy. One of my favs! 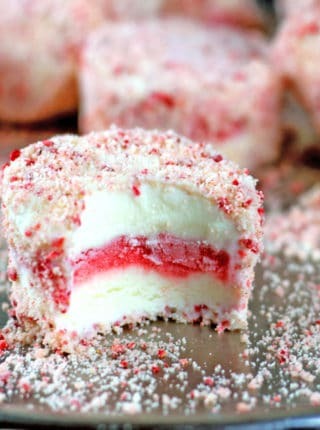 Have to make this! Anything with strawberries is a WIN in my book!